Los Angeles, CA – The Queen of Rockabilly, music legend Wanda Jackson, has recorded a brand new cover version of The White Stripes’ “In The Cold, Cold Night,” which will be premiered as a full audio stream on RollingStone.com November 12th. The slow burner penned by Jack White for The Stripes’ breakout album Elephant is the first single from the brand new tribute album Rockin’ Legends Pay Tribute To Jack White to be released on both CD and vinyl as well as digital November 19th by Cleopatra Records. 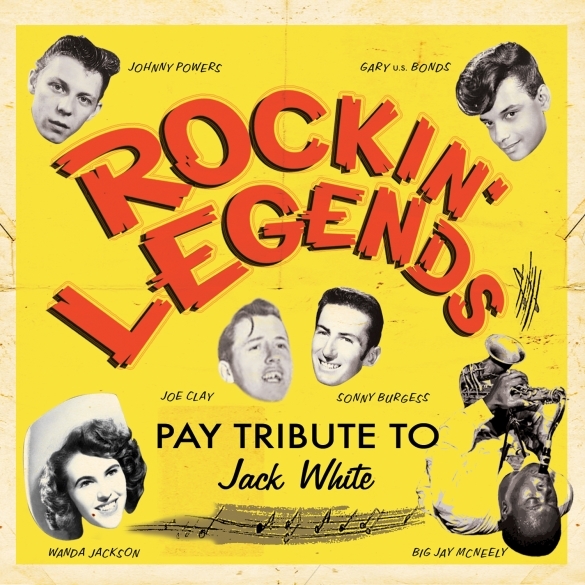 The album is a one of a kind tribute that features several of White’s musical predecessors, giants of rockabilly, early rock and classic punk on whose shoulders White has stood, including Big Jay McNeely, Sonny Burgess, Gary U.S. Bonds, Bobby Vee, Walter Lure of Johnny Thunders’ The Heartbreakers, Knox of UK punk legends The Vibrators and many more! Not all of these names may be familiar to fans of Jack White, but most will know of his deep admiration for the pioneering performer Wanda Jackson who broke new ground in the 1950s as the first popular female rockabilly artist. In 2009, White produced Wanda’s critically acclaimed solo album The Party Ain’t Over, which landed Jackson on the Billboard Top 200 album charts for the very first time in her long career. On Rockin’ Legends, Wanda shows the admiration is mutual with her slightly countrified, ultra sultry take on “In The Cold, Cold Night,” which also features instrumentation and production by Shooter Jennings, son of famed country outlaw Waylon Jennings. And hers is not the only inventive spin on White’s modern alternative classics. Big Jay McNeely brings a swingin’ vocal to “I’m Shakin’” as he trades sax solos with Hawkwind wild man Nik Turner. Speaking of wild men, the lucha libre masked guitar slingin’ trio Los Straightjackets throw down a raucous instrumental version of “Icky Thump” while the aforementioned punk rockers, Knox and Walter Lure, team up with drum hero W.S. “Fluke” Holland, the skinsman for both Carl Perkins and Johnny Cash, on “Seven Nation Army.” Exploring the outer reaches of Jack White’s diverse career, Sonny Burgess brings in his Legendary Pacers on a cover of The Raconteur’s “Steady As She Goes” and Tex-Mex singer Rosie Flores crashes the boys club with a stellar cover of the titular track from White’s recent solo album Blunderbuss. From rockabilly to punk, neo surf to traditional country, no other tribute album has spanned so much musical diversity and history, a testament to the vast range of influences that inspired Jack White’s incredible career. This entry was posted on Tuesday, November 12th, 2013 at 23:23	and posted in Jack White Tribute, Press Release. You can follow any responses to this entry through the RSS 2.0 feed. « Final Album By UK Music Legend, Activist, Anarchist and Writer, Mick Farren Now Available!